Agnieszka Młynarczyk: "The Dybbuk. A Tale of Wandering Souls" begins with the excerpt from the feature film "The Dybbuk" from 1930s. In which moment of your work on the film the idea of starting the film in such a way appeared? Krzysztof Kopczyński: "The Dybbuk" by Michał Waszyński - classic work of the Yiddish cinema, based on the drama by Szymon Anski - accompanied us from the very beginning of the work on the film. In the first sequence of our documentary film, a character from the film by Waszyński appears, the wanderer Meszulach, who has the gift of understanding the other world and foreseeing the future. He is played by Ajzyk Samberg, who earlier acted as Jankiel in "Pan Tadeusz," and during the war he was murdered by the Germans, just like the majority of actors from the film by Waszyński. Meszulach talks about the dybbuk and this has a symbolic dimension. It seems that the character of the dybbuk is of utmost importance to the Judaism believers. What is it, both as a phenomenon and as a character? In Judaism, a dybbuk is a soul of a dead person, who does not leave this world, but rather enters the body of a living person, generally doing harm, but sometimes also bringing good. For us, the dybbuk is a metaphor, which can be interpreted by the viewers without any suggestions. However, it would be a simplification to state that the Jews or the Ukrainians are the dybbuk. Your film was made in a breakthrough time for Ukraine. Watching "The Dybbuk. A Tale of Wandering Souls" I felt a lot of tension connected to the moods of the Ukrainian people. 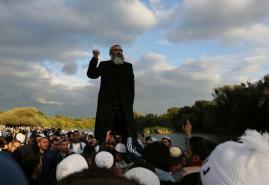 Of course, the most distinctive reason was the coming of the Jews, making a pilgrimage to the tomb of tsaddik Nachman. What hides under the cover of this "external" reason? Which fears harass the local people, or maybe the entire population of the country? The making of the film ended two months before the protests in Maidan, when Ukraine reached more and more strongly to the sources of its national identity. What overlapped this search was the dislike of "others," who are in addition potential immigrants bringing money, but at the same time, bribing the authorities and dangerously - according to the locals - widening their sphere of influence. It is worth noticing that for many Hasids this point of view was totally irrelevant, they did not even know that Ukraine is not a part of Russia anymore. The only things that mattered to them were religious aspects and the closeness of Nachman. How did you feel in Ukraine during the making of the film? How did you feel among the local community and how were you received there as a citizen of other country? Making documentary films is a job which demands the effort of understanding the essence of the place in which one shoots the film as well as the arguments of both sides of the conflict one depicts in the film, even if they are very distant from one's own hierarchy of values. 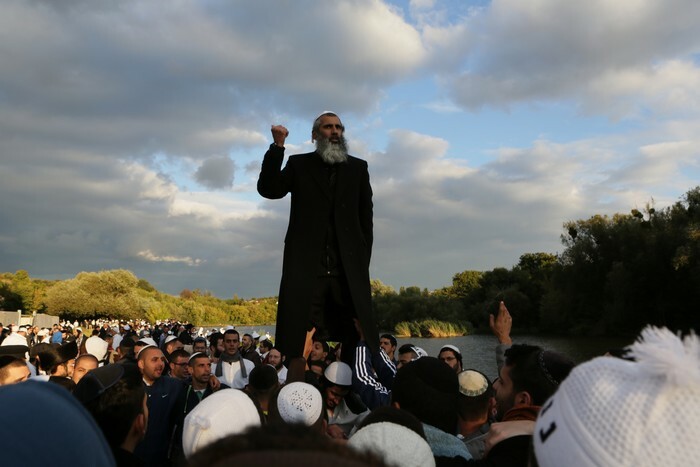 We knew that something important happens in Uman and Bratslav. Both the Ukrainians and the Hasids treated our team in a very friendly way. Of course, there were also some who did not allow us to film them, but everyone has a right to it. One of the film's characters says: "It is never the same for everyone." It is the thought which pervades the entire film. For instance, when it is talked about placing a cross and the possibility of practising the tashlikh in its vicinity. Another example – the situation which happened hundreds of years ago, when Iwan Gonta and Maksym Zalizniak slaughtered several thousands of Jews and Poles living in Ukraine in order to free the "pure-blood" Ukrainians from the oppression of their hegemony. It makes you think. It is worthwhile to start talking about agreement by defining one's aims and the area of common interest. In the case of the Hasids and the right-wing Ukrainians it is difficult, but possible. I strongly believe that it will be successful and that our film will contribute a bit to it, starting the discussion in Ukraine about the complexity of historical conditions. Did you find common ground with any of the characters, did you feel a bond so strong so as to further develop the relationship? As a documentary film-maker I concentrate on the good of the film and on building the relationships with the characters in such a way that benefits the film. I ask questions in such a way that the person who answers the question can express their views to the greatest extent. I rather listen than talk. But in the future, when I come to Ukraine, I will visit all of the more important characters, the ones who are still there. I was strongly moved by the final scenes of the film: one of the protagonists is mourned by his wife, and to his house come the pilgrims, who are grateful to him and want to thank him. How did you feel, witnessing these specific events and documenting human sadness? Shooting these scenes was very moving, both for us, the members of the film team, and for the characters - inhabitants of Bratslav and the Hasids who came there. Participating in the shooting of this film generated powerful and positive emotions in them. Both of them told me a lot about it. What is for you the personal meaning of the story told in the film? Has the experience of working on the film set influenced your outlook on life in some way, has it changed something in you? The work on the film took seven years and during this time a lot changed for the better in my life and in the world around me. Thanks to the film, I came closer to the eschatological issue, which is important for me, as well as to the spirits wandering throughout Ukraine. It is beyond my capabilities to provide them with effective help, but I most sincerely wish them more light. Thank you for the interview and good luck with your new projects. The interview was conducted by Agnieszka Młynarczyk. THE REVIEW OF THE FILM "CALL ME MARIANNA"
THERE ARE NO EASY JUDGEMENTS - A CONVERSATION WITH ELIZA KUBARSKA, THE DIRECTOR OF "K2. TOUCHING THE SKY"
INTERVIEW WITH KAROLINA BIELAWSKA - THE AUTHOR OF THE FILM "CALL ME MARIANNA"
"THERE ARE MOMENTS WHEN ONE MAKES THE DECISION WHETHER TO HELP OR TO FILM, I OFTEN DO THESE THINGS SIMULTANEOUSLY" - INTERNVIEW WITH HANNA POLAK, THE AUTHOR OF THE FILM "SOMETHING BETTER TO COME"